Today i'm gonna show the proxy design pattern in action. The proxy is definitely not as present in our daily work as the other design patterns already presented. But it also has its purpose. Especially when it comes to security, remote accesses or processing heavy weight tasks in background without exposing the real implementation of it. In the example bellow we will simulate a login access. For this reason let's define the credentials first. // and start userAccessCountDown till session expires or user logs off. This is the real access implementation. 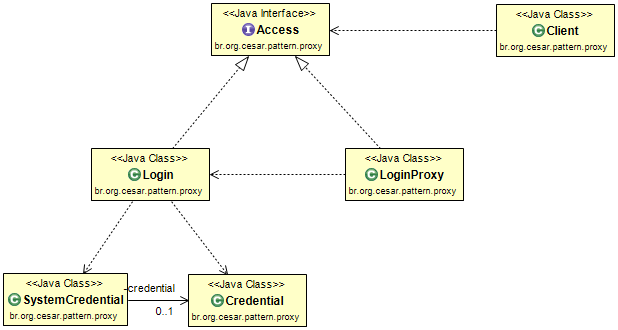 This is the structure responsible for the login process. The proxy sends requests to the real implementation. The user thinks he is dealing with the real implementation while it is not. Here we simulate what really happens. The only thing the user knows is the common interface Access.